This article is based on a customer's idea to publish into specific channels and time. Joocial has several ways to schedule content publishing times, namely Post Agendas, Repeats and Evergreens. However, these options are general to all channels. 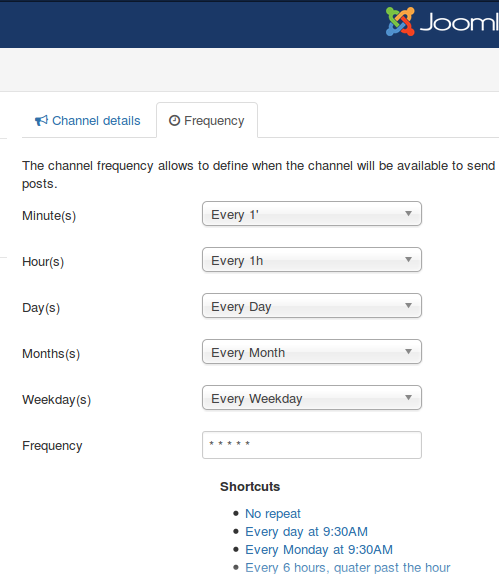 Now, we are introducing in Joocial 8.6 features to specify publishing frequencies for each channel. When a frequency is defined in the channel, it will only be instantiated for publishing following the defined frequency. When it is not active, it will not generate new posts. For example, if a channel has this frequency 30 9 * * *, then it will generate only a post after 9:30 per day. There is also an advanced alternative to building complex execution strategies. Since Joocial 8.6, CRON job execution can detail what channels must be active on each execution. A new parameter channels_filter can be added to the execution command. For example: channels_filter=3,7. This article has introduced a new powerful method to define when a channel can be called to generate posts. In this way, several scheduling strategies are available to define publishing post times at content level, evergreen strategy level and channel level.